Buffalo, NY (November 2016)—Lauren Fix, admired automotive advice provider is proud to announce that she is the recipient of the Car Care Council Women’s Board and the Automotive Communication Council’s 2016 Automotive Communications Award for her social media efforts and her YouTube Channel, https://www.youtube.com/user/laurenfix. Lauren Fix has a robust social media presence on Facebook, Instagram and Twitter. In fact, Lauren Fix’s Instagram has more than 12K followers and her Twitter @laurenfix has 20.5K followers. Her Facebook and Twitter channels focus on automotive history, industry trends and news, basic care and maintenance while her Instagram focuses on cars and car events all to keep her followers engaged and connected to car culture. Lauren Fix’s YouTube channel https://www.youtube.com/user/laurenfix has almost seven million views. The YouTube channel focuses on preventative maintenance, buying new or used cars, leasing cars, reviews, and general automotive news in an effort to keep her viewers informed about the automotive industry and care. The Car Care Council Women’s Board and the Automotive Communication Council recognize those companies and agencies that provide automotive information to consumers and the trade professionals who interact with them on a daily basis. Whether it be through outstanding advertising, marketing, merchandising and/or effective PR, these two organizations would like to recognize their efforts through the Automotive Communications Awards competition. 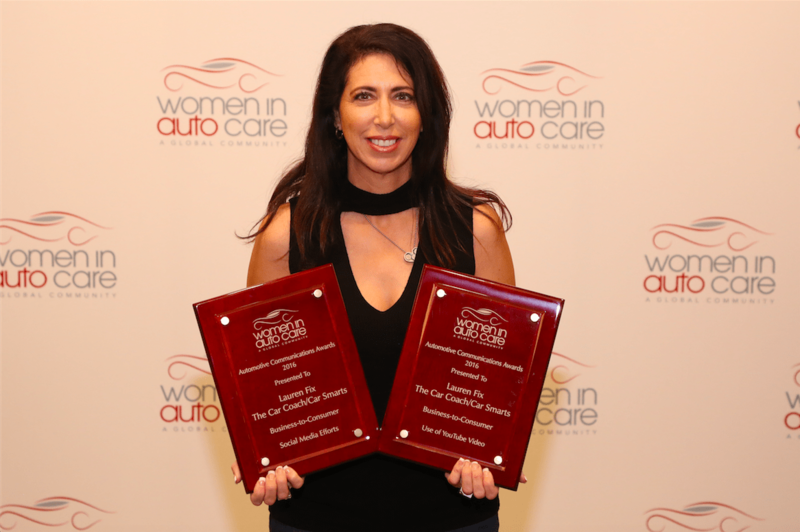 Lauren Fix was recognized at the Car Care Council Women’s Board Press Conference and Reception on Tuesday, November 1, 2016 at AAPEX in Las Vegas. Press, winners and interested parties are invited to attend the press conference followed by an open reception. At both events her work will be broadcast and acknowledged as an ACA winner. The Automotive Communication Council (ACC) is a national, non-profit organization comprised of marketing professionals engaged in public relations, advertising, branding and other communication practices for automotive aftermarket companies. ACC provides a networking forum for the exchange of ideas, information and resources about issues, challenges and trends impacting companies and organizations throughout the aftermarket industry. Founded in 1941, ACC is the oldest continuously operating council in the aftermarket. It is operated by a volunteer board of governors and is managed by the Automotive Aftermarket Industry Association (AAIA) in Bethesda, MD. Membership is open to individuals who are employed or have an interest in the automotive aftermarket. Conferences are held once a year in the spring. Lauren Fix, “the Car Coach®,” is a nationally recognized TV Automotive Expert and an authority on consumer issues such as: new and used cars and trucks, automotive car care, driving skills, and repair and safety issues. Lauren has been a strong part of the automotive industry all her life and is a trophy winning racecar driver! From sales to marketing to design Lauren is a real DIYer (do-it-yourselfer) and offers consumers education from personal experiences. In fact, Lauren Fix was the host and automotive expert for Talk 2 DIY Automotive; a show on the Do-It-Yourself Network (DIY), providing in-depth demonstrations and tips for auto repair. Lauren is the National Automotive Correspondent for Time Warner Cable and The Weather Channel. She also appears regularly as a guest expert on shows such as TODAY, The View, CNN, CBS, CNBC and FOX News, to name a few. Lauren can be seen from coast-to-coast on local morning and mid-day programs as well. She has written articles and has been quoted in several publications including USA Today, Good Housekeeping, Redbook, Woman’s World, Esquire, First for Women, InTouch and Self. Lauren Fix has also been a staunch supporter of The Car Care Council, a not for profit group, for more than fourteen years. In addition, Lauren is the award-winning author of three automotive books, Driving Ambitions: A Complete Guide to Amateur Auto Racing, The Performance Tire, and “Lauren Fix’s Guide to Loving Your Car” with St. Martin Press. Ms. Fix is owner of Automotive Aspects Inc., a consulting firm that provides media consulting and broadcast messaging strategy services. Consequently, she makes a highly credible automotive expert, proving to be been a leader in positive consumer awareness to consumers in the automotive world. One example of Lauren’s consulting work resulted in a Silver Anvil Award winning campaign for USAA and their Auto Circle Webinar, which was created to answer consumers’ car questions. For more information regarding Lauren Fix, please contact Jarrod Holland at (910) 395-9109 or e-mail jarrod@publicityfactory.net. Or visit www.laurenfix.com for more tips from the coach herself. You can also follow Lauren Fix on Twitter @laurenfix, or visit her YouTube channel https://www.youtube.com/user/laurenfix.